Sports’ climbing today is a complex sport, complete with its own vocabulary and equipment that has come about over decades of experimentation. It has for many years been one of the fastest growing leisure activities, involving millions of people worldwide. Climbing has evolved into a vast game with many facets and is even being considered as an Olympic discipline. Around it there has developed a mass of special terms describing particular aspects of the sport (sport climbing, traditional climbing, bouldering, soloing, deep water soloing, competition climbing, and so on), pieces of equipment, moves and particular holds and how to use them. 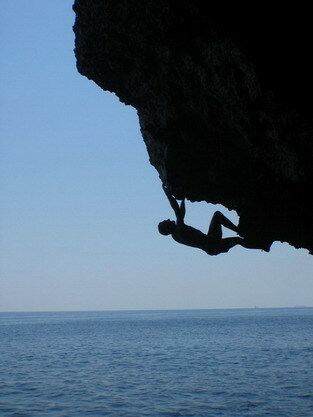 Even the environment in which the sport takes place has changed and developed – from the original mountain gullies and ridges, to the harder rock walls and faces, the smaller outcrops of rock closer to cities, towns and roads and finally to the modern phenomenon of the indoor climbing wall. 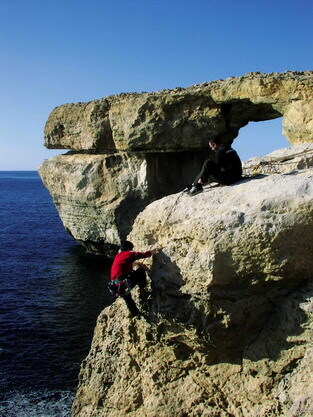 The English army first developed climbing on Gozo and Comino with a number of climbers developing a small guidebook with traditional routes in the 1970's. Since then it has been forgotten as a climbing destination. Although local residents have experienced abseiling through Scouts and the Red Cross. It has only been in the past few years that sport climbers have been returning and opening new bolted routes within the inland limestone crags as well as on the stunning sea cliffs.